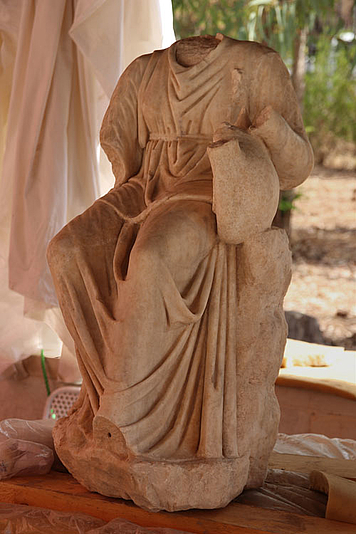 One of the statuettes of Muses. Polyhymnia, holding a kithara, is the muse of sacred poetry, sacred hymn, dance, and eloquence as well as agriculture and pantomime. Also: cithara. Stringed instrument of Greek antiquity. One of the most elegant instruments, played especially on festive occasions and during cult. Belongs to the group of lyres as well as the very similar lyre, which is usually smaller. The word "Guitar" is derived from the Greek word κιθάρα kithara.